Guitarist/Singer, Gary Small was awarded "Best Songwriter" for his recent Native American release "Wild Indians" at the Fifth Annual Native American Music Awards held at the Marcus Amphitheatre in Milwaukee, Wisconsin on Saturday, September 7th. 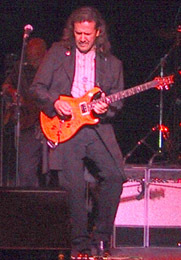 Small also garnered nominations in the "Best Male Artist" and "Best Blues/Jazz Recording" categories. Small also performed at the Awards show with other celebrities: Crystal Gayle, Felipe Rose (Village People) and Grammy Award Winners, Verdell Primeaux, and Johnny Mike.